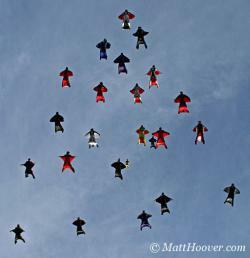 A swarm of humans: The sky is full of human gliders in the flying-squirrel-like outfits. The winged suits are the newest trend in sky diving, giving jumpers the chance to glide at up to speeds of 140 miles per hour.Courtesy Matt HooverWorking on the museum floor the other day, one of the volunteers in my gallery was telling me all about human gliding. He’s big on aviation and had some interesting stuff to share on things he’s heard about and seen (but not actually done). Unfortunately, I wasn’t able to take any notes at the time, but it got me curious enough to Google around and learn more about human gliding. It appears to be just the thing for the sky-diving veteran who’s looking for a bigger adrenaline buzz. 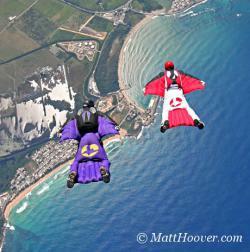 The wingsuit that human gliders wear essentially turns them into a parachute. The flaps between the wearer’s limbs create an airfoil that generates lift as they inflate with air. Gliders can then manipulate their bodies to control the direction and speed of their descent. Jumping from a moving aircraft like an airplane or helicopter also gives the human glider forward speed that translates into lift potential which slows down the fall rate of gliders and gives them a higher glide ratio. Human gliders, when keeping their bodies parallel to the horizon, can reach speeds of 110 to 140 miles per hour. Many human gliders, however, find it a bigger challenge to see how slow they can glide while maintaining their aerodynamics, sort of, but not completely like, stunt pilots stalling out their engines when they’re doing tricks. Some human gliders have slowed themselves down to speeds as low as 25 miles per hour and have lived to talk about it. A more conventional slow speed, however, is about 60 miles per hour. A closer look: From above, here's a closer view of what's involved with human gliding.Courtesy Matt HooverWhile it’s still a pretty new technology to be used in the sky diving realm with experiments going back about 10 or 15 years, man has been striving to glide through the air for ages. In the modern era, between 1930 and 1961 there were 71 reported deaths of people attempting to glide or fly with wings attached to their bodies. There were also four successful flights in that same time. And it appears that human gliding advancements aren’t going to hit the wall any time soon. Experiments are now underway in attaching jet burners to the shoes of human gliders, giving them more thrust and speed to play around with in the skies. It should go without saying, but nevertheless, don’t try this at home kids, Jackass actors or any others who are easily tempted to display poor judgment. Human gliders are very experienced skydivers who have studied up on this type of aerodynamics. That all said, is this something that you’d want to try? Share your thoughts here with other Science Buzz readers. Here are some links if you’d like to learn more about human gliding.